published by the Ohio Center for Sport Psychology, 2004. 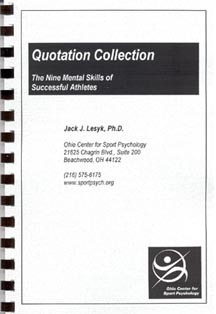 The "Quotation Collection: the Nine Mental Skills of Successful Athletes" is a collection of 369 carefully chosen quotations from athletes and non-athletes, arranged to illustrate major concepts of performance enhancement and the Nine Mental Skills model. The booklet includes an exercise for using quotes to help athletes examine and possibly change their attitudes and beliefs regarding their sport participation and performance. Approximately 83 pages, spiral bound, 5.5 x 8.5 in. format. This item is only available for shipment to addresses in the United States.